You can download files for your purchase right away, here in your account area. This is an add-on product that provides additional functionality or design options for Saturate UI. You must already own at least one Saturate UI license to purchase this product. SALE: For a limited time, purchase a Saturate UI license and you will receive this Wireframe Theme Add-on for FREE! The Wireframe Add-on license will automatically appear in your account download area within 12 hours or less after your purchase of a Saturate UI license. The Wireframe Add-on Theme is meant to help you prototype new app designs faster. In order to keep yourself and colleagues free from unintended visual influence when it is first important to decide where major content elements should appear, it is best to start from in a completely monochrome layout. If you plan on adjusting the styling of Saturate UI, this Wireframe Theme will help you do just that. 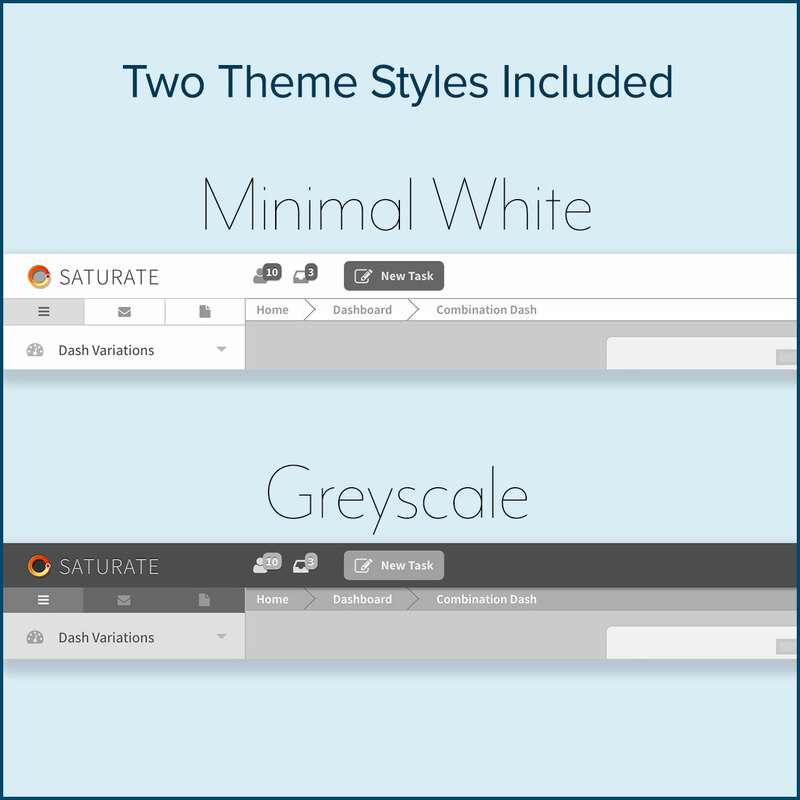 Two theme styles are included - a greyscale version and a more minimal white version. Presenting your client or teammate a wireframe theme will help keep focus on content and functionality and away from design. Your colleague will be asking, "Is this the most important information for this view? ", rather than, "Can we make that intense blue even more saturated?" The Wireframe Theme Add-on includes CSS and Sass files to apply either a greyscale or minimal white, wireframe theme to your Saturate UI project. HTML preview files are also included so that you can see how the 2 included wireframe styles affect Saturate UI. Note: This add-on will be updated as needed to be compatible with future Saturate UI releases. If a Saturate UI update is released and this add-on is not updated along side it, then it is already fully compatible. Support and updates are included free. You will be able to download this product immediately after your purchase is complete. We're using Stripe to process your payment. Stripe is a very popular and secure service for credit card payment handling. Your payment details are secure. Your payment details are processed by Stripe over an encrypted secure connection and never even reach our servers. Your card will be charged when you select "Complete Purchase". Please be sure to read and agree to our Terms of Service and License Agreement before completing checkout. Copyright © 2017 Velora Studios, LLC. All rights reserved. Saturate UI is a collection of interface elements combined in a framework to help designers and developers build their next digital product faster. We built the Saturate UI web application framework to build web apps and new ideas faster in our digital product design and development studio, Velora®. We pride ourselves on offering designers and developers web app themes that not only look great, but have been optimized for speed, ease of customization, and used in real world applications.